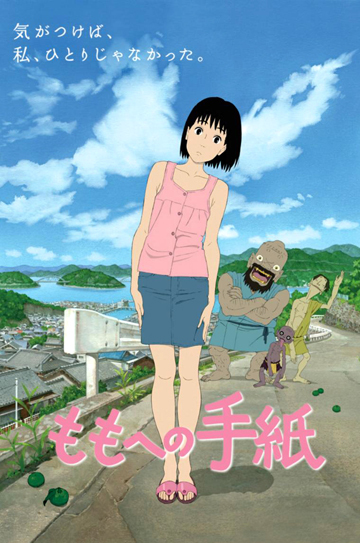 In describing the plot of A Letter to Momo, I suppose the most obvious comparison I could make is to Miyazaki Hayao’s My Neighbor Totoro, with which the film shares a number of narrative elements, but at the same time, the comparison seems reductive and lazy.Momo is a young girl who, after the death of her father, moves with her mother from Tokyo to her mother’s hometown of Shiojima on the Seto Inland Sea. While she is adjusting to rural island life, she encounters three trouble-making yokai, Iwa, Kawa, and Mame, who have come to live in her new home. Throughout this, she ponders an unfinished letter (“Dear Momo,”) that her father wrote before his death. The film defies an easy summarization. Momo is a preteen grappling with her father’s death, a cross-country move, and her mother’s absence because of seminar training for her job. Much of her struggle is focused inward on herself, and it’s not until the end of the film that she realizes that she’s not the only one hurting. While the yokai’s interactions with Momo do provide a lot of comic relief, Iwa, Kawa, and Mame aren’t really sidekicks as much as they are minor characters. They have their own work outside of Momo’s life. 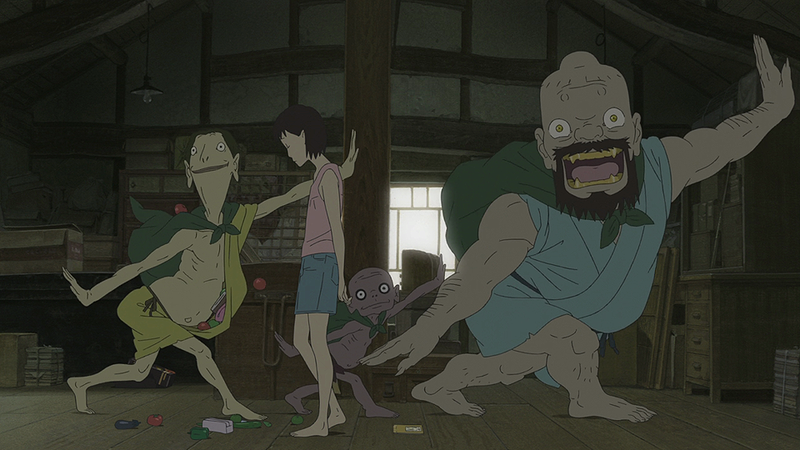 They aren’t benevolent supernatural protectors like Totoro; Momo isn’t some sort of master of the power of the yokai or a reforming mother (like Wendy Darling or Snow White, let’s say)–she is annoyed with their stealing food, but the relationship she has with the yokai ends up being teasing and humorous. 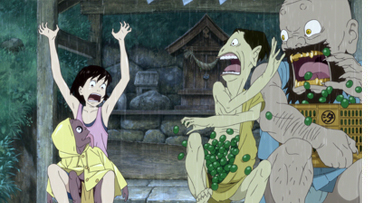 The three yokai talk later in the film about once having been powerful supernatural beings who ate humans, but they’re now reduced to being fruit thieves. If I had to make a comparison about their relationship to another anime, I’d say Momo is like the Haruhi to their host club (in the beginning of the show) or the cast of Tokyo Godfathers–generally she wants nothing to do with their wacky supernatural schtick, but in the end, she ends up having a tentatively friendly, teasing relationship with them. It’s a lot of fun to see her reactions to them, especially in the scene where she gets dragged into a ritual to send a report to Above. Cannot even with these yokai. Image via Moeblob. As for the cinematography, the animation is gorgeous. The scenery is beautifully rendered: the little details in the design of the roof tiles, the rainstorms, the woods, and the shrines are stunning. Even though the film is set in Shikoku on an island with citrus groves, the historic architecture and streets of the town reminded me a lot of Noto. I also loved the details in the way the characters moved, from the way Momo holds her arms when she’s scared to the way Ikuko fixes her hair in the morning. A Letter to Momo is a fantastic female-lead film about family relationships (and local ghosts). The movie passes the Bechdel and the Mako Mori tests. Moreover, it doesn’t reduce the mother-daughter relationship to tropes about women or mothers; it doesn’t provide saccharine views of family or family problems; and it rejects the simplistic narrative of “city people move back to the country and discover the countryside is better” trope. (The rural setting isn’t better, just different.) This particular glimpse into rural Japanese life and its dialects, which are often left out of dramas, anime, and films that are always set in Tokyo, is a real treat. It’s a slower, introspective film, yes, but it’s a deliberate, heartwarming, but not over the top film that immerses you fully into its world; a natural successor to Ghibli. I highly recommend it.